Enter the world of high end model ships building with ModelSpace's superb model ship kits! Fitted as a frigate, HMS Bounty is the ship that sailed into the history books in 1789 when Fletcher Christian and his fellow mutineers forced the tyrannical Captain Bligh and 18 loyal crew members into an open longboat with few provisions and cast it adrift. The Bounty sailed on and anchored at Pitcairn Island, while in an extraordinary feat of seamanship, Bligh and his men survived the open sea to make land on the island of Timor: a journey of 4,000 miles! 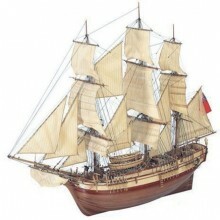 Enjoy the thrill of building model ships at home with our fantastic range of kits. Perfect as a solo activity or as something to enjoy with the kids, we have everything you need to make perfect replicas of water vessels from countless eras. The power of a battleship, the design of warships and the beauty of sailing boats can all be replicated in models that you build with your own two hands. These beautiful wooden ships are exact replicas of the real thing, giving you the chance to own and build your very own boat for a fraction of the cost of the real thing. Model sailing boats including a battleship model make great long-term projects, offering the chance to use your hands and do something creative. We also have a range of detailed planes, trains, cars and more for you to make once you've completed your model boats - giving you the chance to create a full fleet of vehicles.